I would like to start by looking at our current bull market in the HUI. I’m going to try and show you how our current setup is what one would expect in a bull market. A stock or stock market does one of three things. First, it’s building out a reversal pattern that will reverse the current trend. Second, it’s building out a consolidation pattern that is consolidating the current trend. Third, the price action is starting to impulse after breaking out of either a reversal pattern or consolidation pattern. This is how markets works. Below is a long term monthly chart for the HUI which shows the price action described on the paragraph above. As you can see the price action is either building out a reversal pattern, consolidation pattern or is impulsing in one direction or the other. This chart shows classic Chartology. 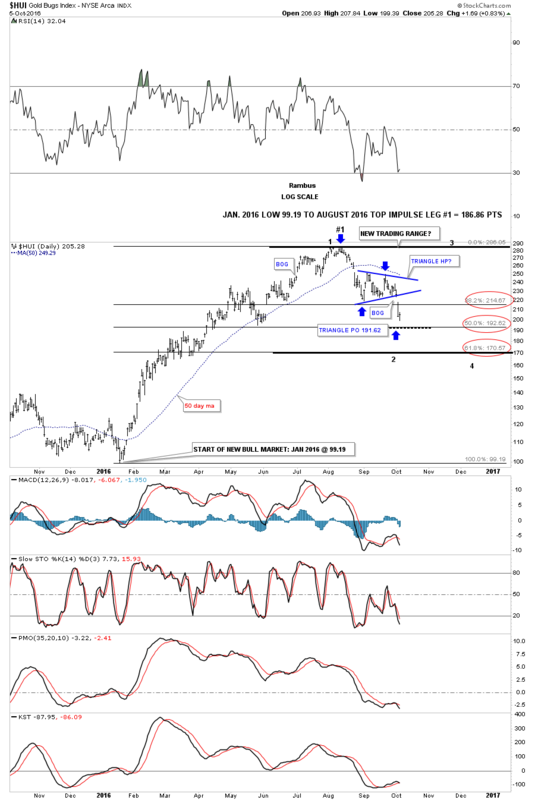 On the right hand side of the chart the HUI had a big impulse move up out of its bear market low in January of 2016. At some point, during an impulse move, it will finally run out of gas and will begin to consolidate its gains. This is what I believe is happening presently. Note the bull market that began in 2000 with all the blue triangle consolidation patterns with an impulse leg between them. We’ll look at those in more detail later. This next chart is a weekly chart for gold which I call, JUST ANOTHER BRICK IN THE WALL, which shows all the consolidation patterns that formed during gold’s bull market years from 2000 to 2011. I’ve always said this was one of the most beautiful bull markets of all time. Put yourself in anyone of those bigger consolidation patterns to get a feel of what it would take to hang on during the consolidation process. 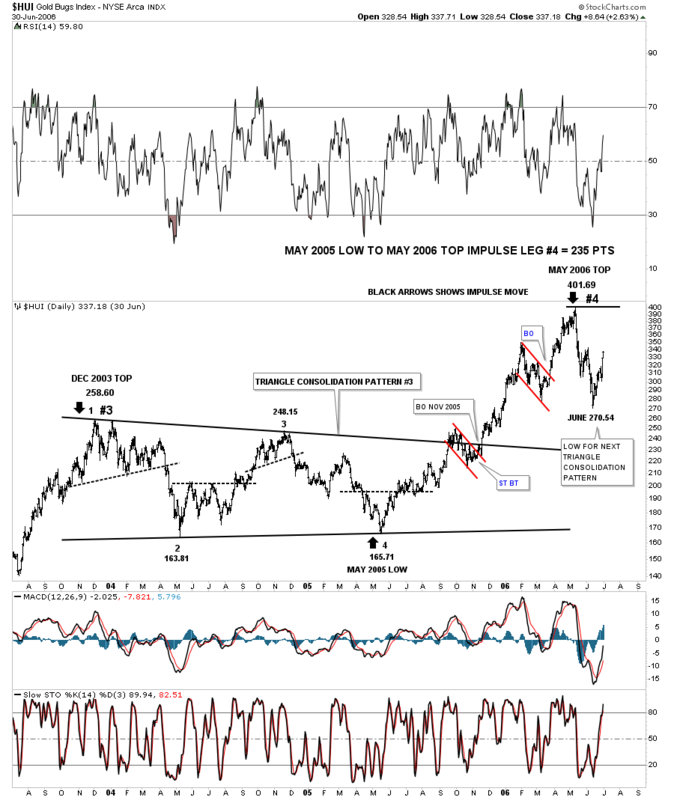 What’s important to notice is that gold never made a lower low except during the 2008 crash low as shown by the black bullish expanding falling wedge. If you look real close you can see little green triangles that formed halfway in many of the impulse moves up. Looking to the right hand side of the chart you can see the very large black expanding falling wedge which is very similar to the 2008 black expanding falling wedge. Since the bear market low in December of 2015 gold has made a series of higher highs and higher lows. At this point the one thing that will get me concerned about our new bull market would be if I see gold close below the recent low, which was the back-test to the top rail of the blue bullish falling wedge. One last note on the chart below. 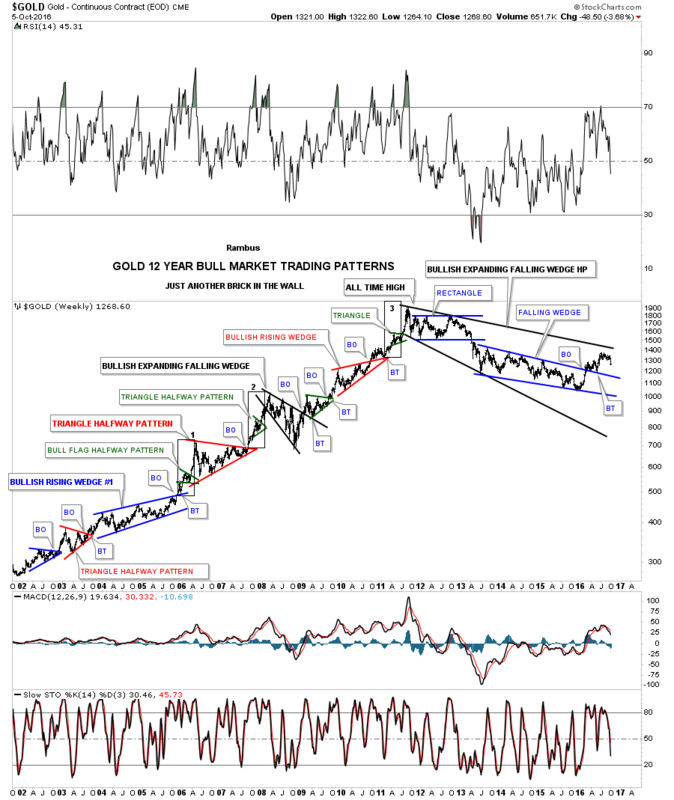 Notice how gold made all lower lows and lower highs from its bull market top in 2011 until the breakout above the bullish falling wedge. 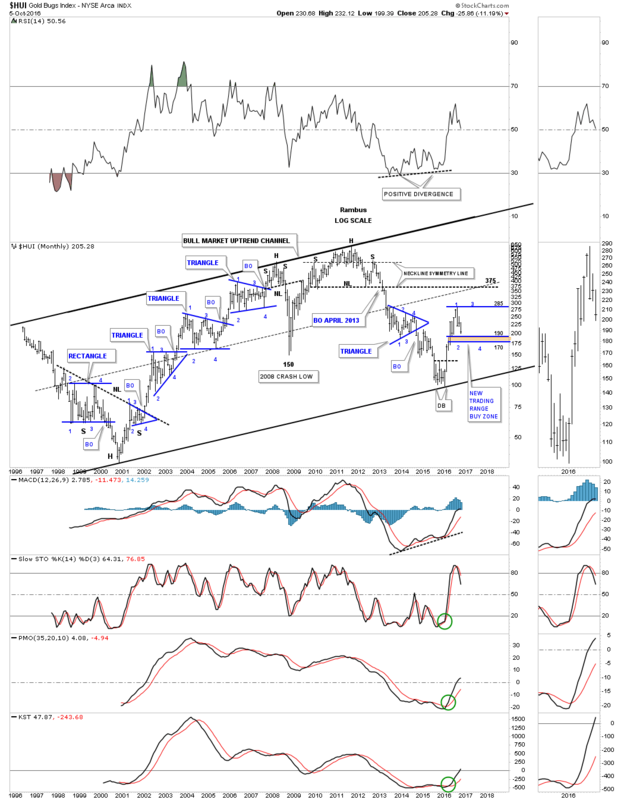 This next chart is an old weekly chart for the INDU which shows the same thing as the gold chart above. This eleven year chart starts with the H&S top in 2007 which lead to the infamous bank and housing crash. That H&S top, which reversed the bull market up to that point, was the reversal pattern. The second reversal pattern formed at the 2008 – 2009 crash low which was the same height as the 2007 H&S top. From that bear market low in 2009 began one of the most hated and greatest bull markets of all time. Note the small H&S top that formed back in 2011 which temporarily reversed the uptrend. 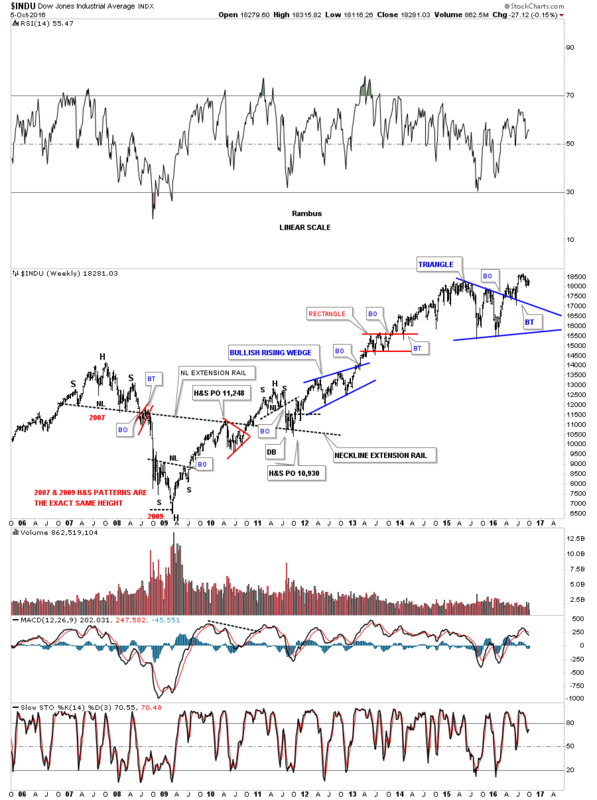 As you can see that small H&S top found support on the old neckline extension rail that was actually taken from the 2007 H&S neckline labeled neckline extension rail. It’s pretty hard to see but there was a small double bottom that formed on the neckline extension line which reversed the price objective from that small H&S top. Now I would like to turn your attention back to the present daily chart for the HUI keeping in mind the charts we just looked at above. 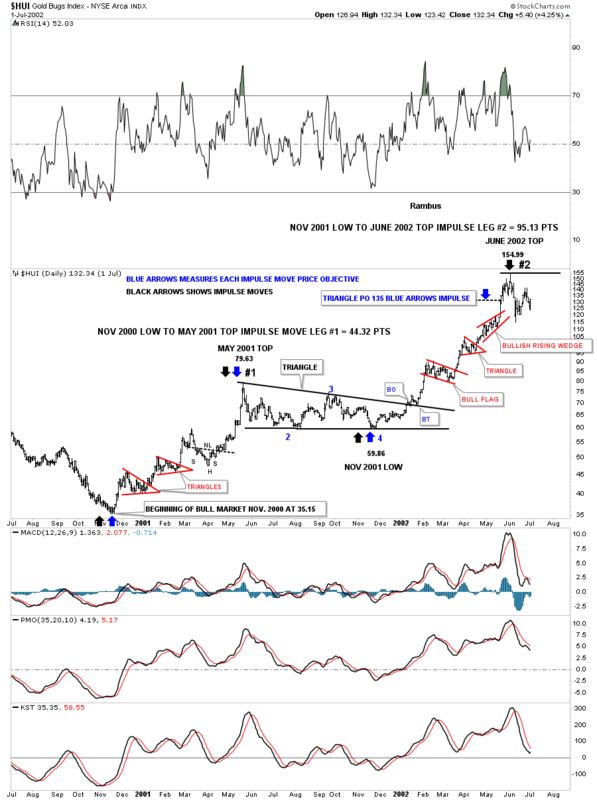 This first chart for the HUI shows the impulse move up in its new bull market that began in January of 2016 and topped out in August of this year. As you can see this correction is bigger than any of the previous small correction that formed during this first impulse move up. As I mentioned previously I would expect the 62% retrace of the new bull market to be the worst case scenario if the HUI dips that low. The little blue triangle has a price objective down to the 50% retrace which comes in around the 192 area. At this point in time there is no way to know what type of consolidation pattern may build out…so for now the top and bottom trendlines are horizontal. As you can see we are now closer to the bottom of this new trading range than the top. So far this is normal Chartology behavior taking place. 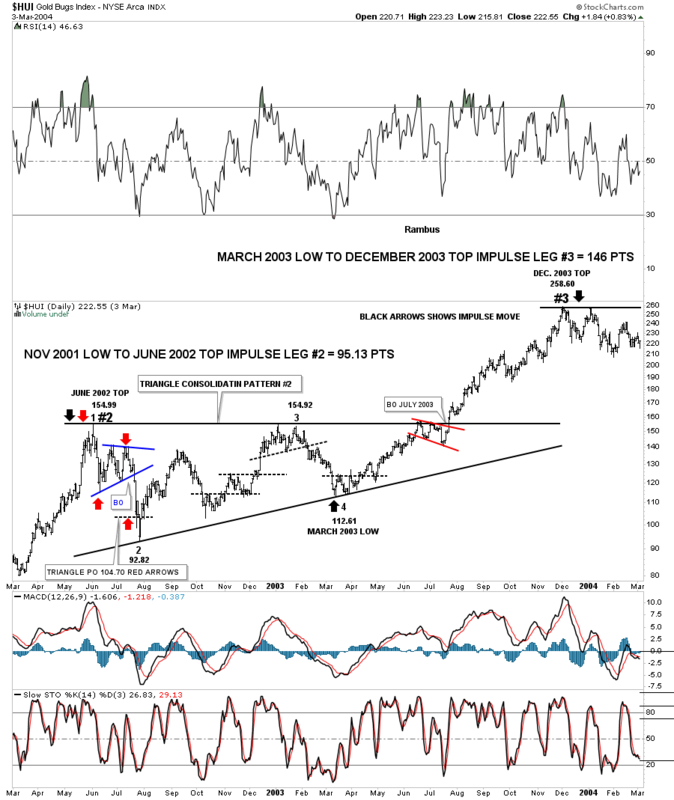 Before you read this next section please go back and review the first chart in this post which is the 20 year monthly chart for the HUI which shows all the blue triangle consolidation patterns that formed when the bull market began in 2000. This first chart shows the bear market low in November of 2000 and the first impulse move up that topped out six months later in May of 2001. That first impulse move up gained 79.63 points before the HUI began to correct and build out its first consolidation pattern which was the black triangle. After a nearly six month correction the HUI began its second impulse leg up gaining 155 points in six months. Note how each impulse leg formed three smaller consolidation patterns. At this point there are two impulse moves up with the triangle consolidation pattern sitting in the middle. This next chart for the HUI starts where the last one leaves off at the June 2002 top, impulse leg #2. The beginning of this second triangle consolidation pattern looks eerily similar to our current one. The red arrows measures the price objective for the small blue triangle down to the 104.70 area. As you can see the price action spiked to the bottom at 92.82 which created the second reversal point in the black triangle that built out over the next year. Impulse leg #3 began in March of 2003 and ended in December of 2003 gaining 146 points. You may have notice the small black dashed lines which shows small reversal patterns at the reversal points. In big consolidation patterns like this these are the patterns I look for to try and trade within the consolidation patterns. Sometimes they’re very obvious but other times they can be hard to spot in real time. The main thing to keep in mine when trading these consolidation patterns is the big picture. It’s easy to get chopped up trading these consolidation pattern but knowing where the top and bottom of the trading range are located can help immensely. This last chart for the HUI tonight starts where the last one left off at impulse leg #3. Again notice the black dashed lines which helps us find the reversal points inside the nearly two year triangle consolidation pattern. Impulse move #4 ran from May 2005 to May of 2006 which took one year to complete. This impulse move gained 235 points before it was finished. Big patterns equals big moves. Note the hard shakeout after this last impulse move finished at 401.69. That two month shakeout down to 270 was actually the low for the next triangle consolidation pattern that would form.